Oman is emerging as Iran’s Trojan Horse trying to destroy the Gulf Cooperation Council (GCC) from within. Sultan Qaboos bin Said, the monarch of Oman since 1970, reportedly played a key role in facilitating the secret U.S.-Iran talks leading up to the November 24 “historic” nuclear deal, according to The Associated Press. Oman is isolated from much of the rest of the Arabian Peninsula by a formidable mountain range, while Iran is just across the narrow Strait of Hormuz, a critical waterway for global oil shipments that has at times raised tensions between the U.S. and Iran. As early as 2009, according to Wikileaks, the sultanate offered to arrange talks between the U.S. and Iran – which hadn’t had diplomatic relations for 30 years – on condition that they were kept quiet. But it was reportedly the hostage crisis of three American “hikers” that brought him into a mediating role between the two sides and helped win the release of the three Americans, who were arrested and accused of spying while hiking along the Iran-Iraq border. With that success in his pocket, Sultan Qaboos offered to facilitate a U.S.-Iran rapprochement, the AP reports. In March, U.S. and Iranian officials met in Oman, Secretary of State John Kerry followed up in May, and the talks took on a momentum of their own after Hassan Rouhani replaced Mahmoud Ahmadinejad in Iran’s June elections. Sultan Qaboos wasn’t in front of the cameras in Geneva, but a news report in the Saudi daily al-Hayat this morning speaks of “fears within the GCC of Iranian-Omani efforts to break up” the six-member club grouping Saudi Arabia, Kuwait, Bahrain, Qatar, the United Arab Emirates and Oman. Oman and Saudi Arabia bickered publicly over the GCC’s future last week at the three-day Manama Dialogue in Bahrain, a forum on Middle East security. A much-anticipated Gulf union is inevitable and will happen because people in the region are keen on it, Prince Turki al-Faisal, Saudi Arabia’s former Intelligence Chief who also served as ambassador in both the United States and United Kingdom, told the conference. He was commenting on remarks made Saturday by Yusuf bin Alawi bin Abdullah, the Omani foreign minister, who said his country rejected the Gulf union and would pull out of the club if the union were approved. “Everyone has the right to express their opinions,” Prince Turki retorted. “However, this will not prevent the union from happening. Oman can join it then or later, or not at all,” he said. 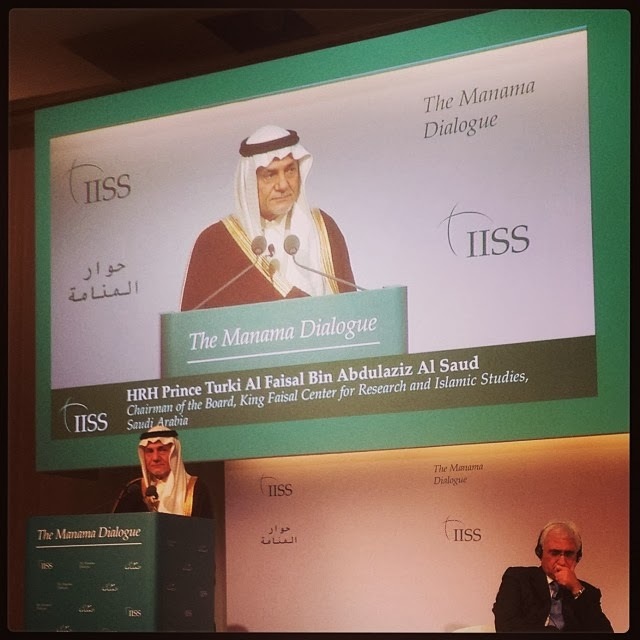 On the nuclear talks in Geneva last month between the 5+1 world powers and Iran, Prince Turki said they lacked a “very important factor” – namely, the participation of Iran’s Gulf neighbors. “I don’t know the reasons for that… because eventually we are the ones that will be affected by anything -- a military event or a nuclear leak or any earthquake that may hit the [nuclear] sites in Iran,” he remarked. The six GCC partners hold their annual year-end summit in Kuwait, tomorrow, Tuesday. The region is unlike the one that existed three years ago. Iraq’s disintegration is an undeniable fact. The dismemberment of Yemen is flagrant. What looked like a Syrian intifada turned out to be a sectarian war feeding tension into the neighbors’ arteries. Today’s world is much more dangerous than the world that witnessed the birth of the GCC in 1981. Bar Israel, four key regional states will play a dominant role in this difficult phase depending on their respective internal stability, resources and alliances. They are Saudi Arabia, Egypt, Iran and Turkey. GCC leaders who meet in Kuwait tomorrow are aware of the magnitude of the threats to stability and roles. They know the importance of adapting to change. Oman’s attitude clearly unveiled that the Gulf union’s journey won’t be trouble-free. But sensitivities should not forestall attempts to reconcile views of the various GCC member states on how to handle this phase of containing risks and assigning roles.